Dowco's St. Louis garden weeding service will enhance your property's curb appeal by keeping your beds weed free all season long! The keys to a clean, weed free garden starts in the spring. 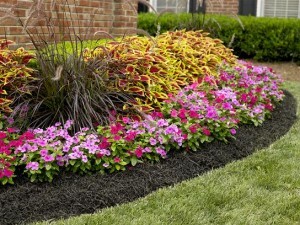 In the spring, Dowco will freshen your beds to prepare for the upcoming summer. This spring bed cleanup includes removing weeds, leaves and debris. Spent perennials and small ornamental grasses will be cut back if appropriate. Mulch beds will be raked smooth to prepare for a fresh layer of mulch. Rock beds will be smoothed. Afterwards, Dowco will begin monthly bed maintenance treatments which include pre and post emergents to stop garden weeds in their tracks. Every week, Dowco will pull weeds in the gardening beds at the same time as your lawn mowing service! Pricing for St. Louis garden weeding service starts at $20/week. Request a quote today for your St. Louis garden weeding service from Dowco! We'll make sure that you have a property that sparkles!